And so the quest for Thanksgiving vegetables continues! From now until Thanksgiving, I'm collecting vegetable recipes perfect for Thanksgiving tables. So far, I've collected recipes for green beans and Brussels sprouts and potatoes and ... and ... more to come! Today's featured vegetable is the 'oddball', that is, any out-of-the-ordinary vegetable whose appearance might be welcome on Thanksgiving tables. First up ... the sunchoke, also called the Jerusalem artichoke, used in a simple salad, almost a slaw. It's nothing more than sunchokes from fall farmers markets, turnip and carrot in a simple vinaigrette. It doesn't stand up and shout, there will be no moaning or exclaiming. But it's very good, an earthy respite from the rich- and strong-flavored dishes for which Thanksgiving is famed. 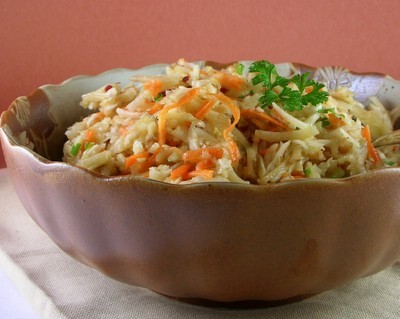 Grate the sunchokes, turnip, carrot and onion in the food processor and transfer to a bowl. In the same food processor, whiz the dressing ingredients. Stir into grated vegetables. Taste and adjust seasonings. Stir in parsley. How to recognize sunchokes? They look knobs of ginger. Do sunchokes need to be peeled? No, and a good thing since all the knobs would make that a fussy endeavor. Do sunchokes need to be washed? Yes, carefully, for between the knobs are pockets of collected earth. Just break off the knobs to wash.
Must sunchokes be cooked? No, I like them raw, either grated (my favorite way, so far) or in chunks like a carrot. I'm embarassed to ask, but: (I've never had a sunchoke! Shame on me!) Can someone tell me what they taste like? Anything like artichokes? Oh please, Vanessa, never be embarrassed! It's all so much about the learning, isn't it? I only tried sunchokes a year ago, they're not exactly 'mainstream' in the U.S. But they ARE good. Taste, okay, think wet like a water chestnut, but firmer. Think earthy like a potato, but not starchy. Think a bit of brightness like a cucumber. Think 'alive' like a kohlrabi but not dense. And no ... nothing like an artichoke! I guess it must just taste like a 'sunchoke' and you'll have to try one for yourself! A little bite is good to start ... I like them better grated small, like in this salad. I've been curious about sunchokes, so I'm very glad to see this recipe. It looks very nice and it's fun to serve people something they probably have never tasted. I agree -- so much fun to serve "new" vegetables! My latest addiction is chayote squash. One of my cooking groups just did a Mexican menu, with a chayote salad tossed in a spicy sauce. I've also had them stuffed, and even cooked with scrambled eggs. Alanna, maybe you'll share some of your recipes??? Pille ~ More! My goodness. This salad I like better than the apple dish, maybe because of it being grated. Sher ~ They're worth picking up! Lydia ~ Ah, yes chayote, aka mirliton and a few others! I did one favorite chayote dish last year but the real queen of chayote these days is Fatfree Vegan, like this casserole. Let me know what you make, Lydia! This is a fantastic dish..
brava! a sunchoke slaw. i love the idea. I almost completely disregarded this recipe...just started grating rainbow carrots and sunchokes (didn't have turnips), gave up because my grater is a pain, used the chopper to finish up the sunchokes (which I didn't peel, so they look even more like raw potatoes)...didn't want to start my last onion, didn't bother with the parsley (though I've got some, so may add it after all), used a premade vinigrette. In short, the finished product looks awful, but still tastes great! Jeri ~ Very funny! Isn't it lovely that vegetables (and recipes) are so very forgiving?! !